My "New" Hardtail Race Bike. The Masochist. Discussion in 'Downhill & Freeride' started by ZenkiGarage, Jun 6, 2012. So, I know a lot of you wont dig this build, but I had ton of fun building it, and its a ball to ride. I sold my full squish DH rig a couple years ago, and decided Id start riding again this year, but wanted a hardtail, so I built this up over the last 2 weeks. 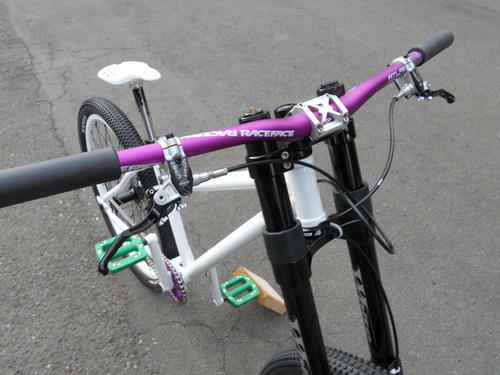 -The frame is a Soul Cycles Roscoe that i bought about 4 or 5 years ago and never finished building. I modified the rear triangle for more DH friendly geo(not perfect, but better). Ended up with 13.7 BB height and 63.5 HA. 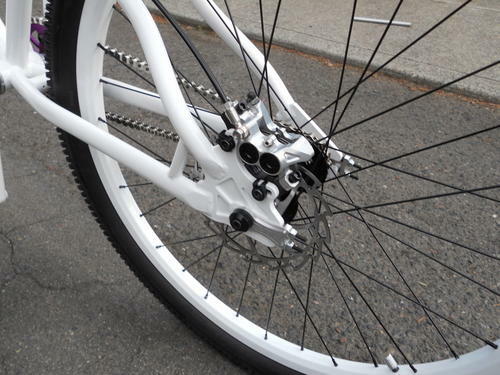 Right now the gearing is 30/14, and seems to work for fast-ish runs, will run 30/15 for more pedally courses. It ended up at 36.2 lbs, and I've nicknamed it the Masochist, for obvious reasons. *ucking loving it! Hardtails are the ****, they teach how to ride proper like nothing else. What do you mean by "modifying the rear triangle"? and yeah, what is this "modification" that you speak of? I recognize that parking lot! seems a little odd to run a BB as high as a bike with 8 inches in the rear. i would think you could get away with a much lower BB which would be the (only) advantage of a HT...? Basically, I cut off the rear, took a length out of the seat stays(the isection that had the canti mounts) then replaced it with a shorter section, then welded it back up. That dropped the bb and slacked it out more. Wanted to drop the bb more but would have required a lot more cutting and rewelding. I definitely have the bug again, so next will be a complete custom frame. I really like it. My only complaints are weight, but I knew it was heavy before I ordered it. My only other complaint was that the leg guard bolts were nylon, so I replaced those. Did you weigh it? I hear 8.5-9.5lbs. 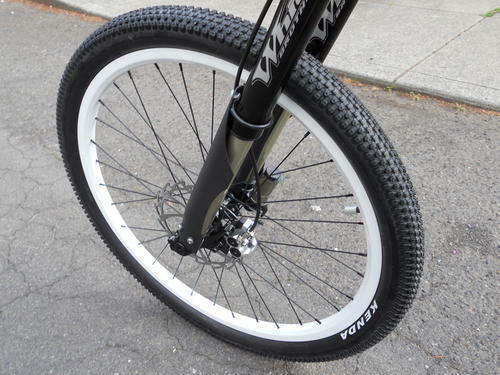 8.5 is only a pound heavier than my 66, and that's not much for a freeridey fork. They go for cheap nowadays. i loved the 66 i had on my old sx trail. rode it super hard, never had an issue. What 66 weighs 7.5 lbs? My 06 66RC2X weighed 6.5 lbs. I didnt weigh it. I can though. I really like it, and at the price they are going for right now, I can ignore the extra poud or so. Nice work there! very clean looking! Do you work in a machine shop or something? Well if you get around to it, go for it. 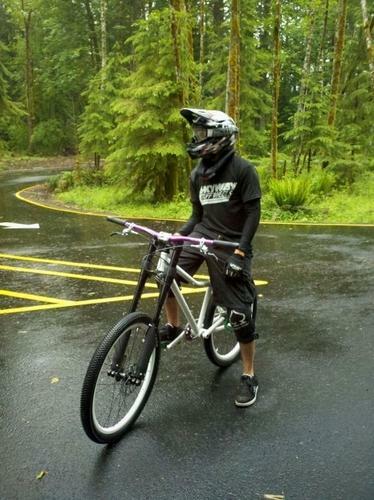 That's a really neat bike though, and after seeing the guy ripping in whistler on a hardtail, I'd imagine it would be a lot of fun. I think I pegged my 08 66 at 7.5lbs. It has some bushing slop and the axle doesn't hold. Would be great for somebody building up a cheaper DH bike, but I'm looking to upgrade. The damping is OK, it's the chassis I don't like. Supposedly Alistair might have some spare lowers, but I don't want to beg...and I wouldn't mind 8" of travel to balance out the 8.75 I have in the rear. I've been a machinist / fabricator for pretty much my entire adult life. Again, nice work, and your idea about fabricating a whole frame gets my thumbs up too. that looks fun, but I don't understand your tire choice. 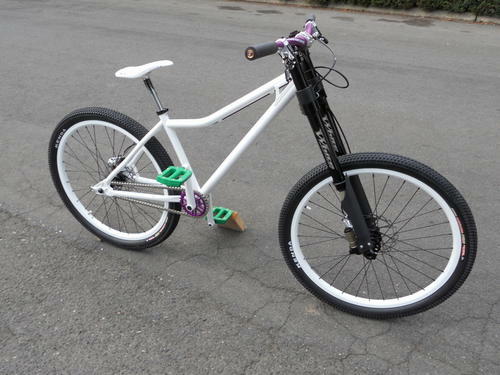 Very cool looking bike, DH on a hardtail is great fun. I wouldn't go too mental with weight savings, I tried it and fuund the bike just got too nervous and a BB heit like yours won't help that much. I raced my hardtail for a season and a half and loved it then I bought a dually and only knocked a few seconds off my PB. Because you dont know where i was riding lol. The trail I ride the most, the small blocks are money! Just have to watch the sidewalls. On rocky courses they'll be switched out. I wasn't worried one bit about weight. The light parts I used, I only did because I thought they looked good haha. Thanks man. Next will be a custom frame so I can get the BB a lot lower. 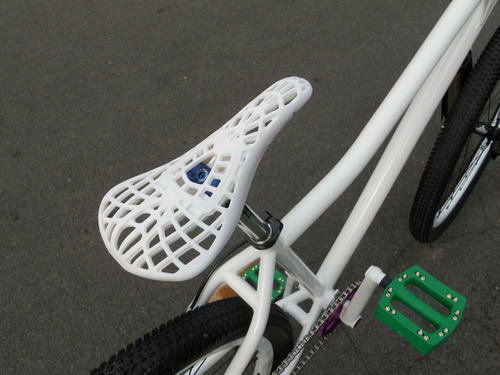 Should make for a pretty rippin' hardtail.